This article will focus on the tier one decks, their strengths and weakness, and the like. These are the decks you should focus on beating or just play yourself. Knowing a deck is the first step to beating it, so this article will be helpful regardless of if you decide to play one of these. Let’s get started. This deck has been discussed to death, so I’ll try to skim over it a beat. Here’s the best list for the deck right now and the one I would use at a tournament. I love Zoroark-GX and I played this deck in my last Standard-format Regional with a similar list. I lost my win-and-in to miss Day Two, but my teammate Daniel Altavilla placed second with the deck. As you may know, he lost to Blacephalon-GX in the finals. It was something we didn’t expect, and that was unfortunate as we had no counter to the deck. I think moving forward, this deck can afford to spread itself a little thinner and have more answers to fringe meta decks like Blacephalon-GX for instance — it isn’t a huge price to pay. There is some space in this deck but it’s a little more inconsistent than other Zoroark-GX / Lycanroc-GX lists because of the inclusion of Lucario-GX. 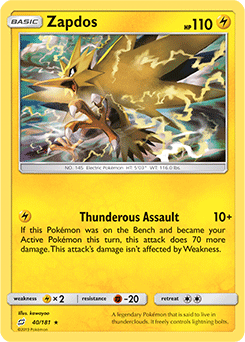 Lucario-GX is a necessary evil with Pikachu and Zekrom-GX so prominent in the format; you need a better counter to it than Lycanroc-GX itself. 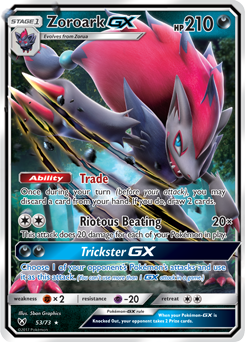 This deck can be tweaked in a few directions, most notably the inclusion of Lycanroc-GX from Team Up for the Energy denial option and two more unique and strong attacks. Weavile is another direction you can go with, but I believe this list will give you the best overall chance against everything, particularly against Pikachu and Zekrom-GX. Professor Elm's Lecture is inferior to Lillie because Lillie sets you up for a stronger second turn. With Pokémon Communication offering another reliable way to fetch Pokemon on the first turn other than Nest Ball and Ultra Ball, it’s imperative that you play the Lillie engine over anything else. The deck is great when Zoroark-GX sets up, but Marshadow’s Let Loose is the bane of its existence right now. I prefer decks that can attack the first turn unless there’s a lock deck that is hard to beat — I like those too. This deck is solid, it can do well, but I wouldn’t expect dominant greatness with it because of all the unpredictability of Marshadow and general opening turn consistency.